EastEnders' Phil Mitchell is to be put through hell after receiving terrifying threats from a mystery stalker. The Walford hardman - played by Steve McFadden - goes into meltdown when he starts receiving cryptic messages in the post from someone who knows all about his murderous past, and is seemingly set on revenge. With the first letter containing a photograph of the homeless man the burly mechanic accidentally killed when he torched the car lot in 1993 to get insurance money, Phil becomes aware that his stalker is determined to avenge his victim's death. 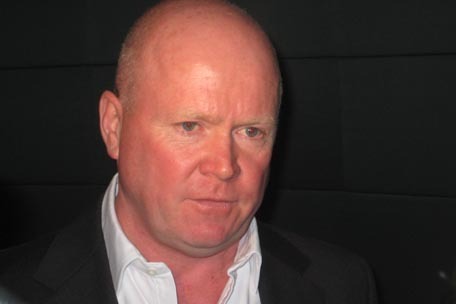 An insider told the Daily Star newspaper: "Phil is not usually rattled but this has really got under his skin. Someone is dredging up ghosts from his past." In attempting to figure out who is behind the horrific hate campaign, the Albert Square baddie will point the finger at his long list of existing enemies, including Janine Butcher (Charlie Brooks), Jack Branning (Scott Maslen) and Walford wimp Ian Beale (Adam Woodyatt). With new hardman Derek Branning - played by Jamie Foreman - set to join the BBC One soap later this month, furious Phil will even accuse him of the evil plot, potentially leading to a face-off between the perilous pair.